Best friends, big fans, a mysterious webcomic, and a long-lost girl collide in this riveting novel, perfect for fans of both Cory Doctorow and Sarah Dessen, & illustrated throughout with comics. If you love Seattle. If you've loved previous Cherie Priest books. If you enjoy a dark mystery where friendship is important. Buy. This. Book. In spite of the lukewarm reviews I had read before grabbing a copy, these three factors convinced me to read it anyway and I AM PRINCESS X does not disappoint. Like Becca Fitzpatrick's Black Ice this is a dark mystery with a really terrifying, looming baddie feel. I loved that May didn't give up on finding out the truth about the web comic even when it became ridiculously dangerous for her. I really want to tell more about the plot but I hate spoilers so just trust me when I say it's full of techie stuff and a really frightening bad guys makes it a cat-and-mouse game that's sure to keep you on pins and needles. 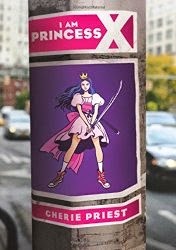 While I AM PRINCESS X would be great for the younger YA reader I think it'll be an enjoyable read to any YA fan.